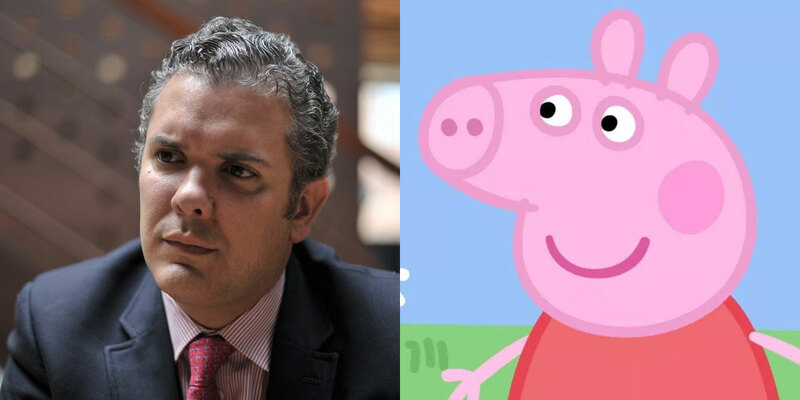 Contrary to what Google says, Colombia’s new president is not called Peppo Pig, but Ivan Duque. Internet users looking up “Colombia’s President” have been told by the search engine that the South American country elected a person with almost the same name as the popular animation character Peppa Pig. This is false. Colombia’s president since Tuesday is Duque, a 42-year-old son of a late minister who rapidly made career through Colombia’s political nepotism network that has produced dozens of incompetent and corrupt heads of state. Duque’s opponents in Colombia have long compared the conservative President with Porky Pig after cartoonist “Matatador” began depicting Duque as the pet pig of hard-right former President Alvaro Uribe. Google-savvy opponents of Duque are now apparently trying to associate their country’s leader with “Peppa Pig,” the popular cartoon character for children. Colombians — and now English-speaking internet users — have been purposely misled by the mixing of fact and fiction for years. Late author and journalist Gabriel Garcia Marquez won a Nobel Prize for Literature for his ability to weave historical events into fictional tales. The mixing of fact and fiction has been an integrated part of government propaganda and political campaigning for decades. At one point during the election race, more than half of Colombia’s population believed that electing Duque’s opponent would result in communist tyranny, according to one pollster. 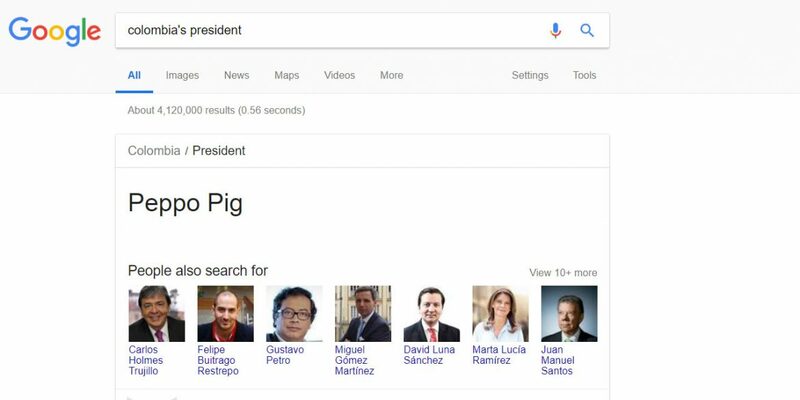 The apparent “Google bomb” that has produced the “Peppo Pig” result could have a similar effect and falsely make internet users believe that Colombia’s president is a cartoon character that serves an audience with the cognitive abilities of a three-year-old.